Car rollover accidents are among the most frightening experiences any driver or passenger can face. Car accident lawyers take on these highly violent incidents that are very often physically traumatic and always emotionally scarring. They also account for a highly disproportional amount of suffering. According to the National Highway Traffic Safety Administration, of the nine million or so auto accidents that take place yearly on American roads, only around two percent involve a rollover. Yet 35 percent of all fatalities that occur every year are car accidents in which a rollover took place. Even when these wrecks do not result in death, they often cause severe injuries that affect the head, brain and spinal cord. Paraplegia and quadriplegia are not uncommon outcomes. Among the most common injuries from a vehicle rollover are broken bones and damaged internal organs. Yet often, these accidents are not the result of driver error; rather, they frequently happen due to either defective car parts, such as defective tires, poor car design or the negligence of the driver of another vehicle. If this has happened to you, you stand to recover your injury-related expenses through filing a rollover car accident lawsuit. In addition, you also stand to obtain the funds needed to cover all future injury-related expenses. 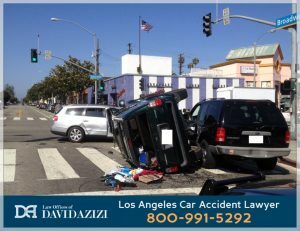 You can discuss this kind of incident, or even one in which your car flipped over, with one of Greater Los Angeles’ most highly rated personal injury attorneys, David Azizi. He and our entire team at the Law Offices of David Azizi are ready to assist you. So please call us anytime, 24/7, at 800-991-5292. When you call, we will connect you with David right away for a free consultation. David will listen carefully and compassionately to your descriptions of both the accident and the injuries you’ve had to deal with since then. If he takes your case, he’ll get to work immediately on investigating the crash. He’ll also do what most attorneys of his caliber don’t do, and that’s give to you as his client his cell phone number, so you can ask any questions you have about the legal process as they come up. Wages lost due to an inability to work are also figured into these calculations, which include not only past expenses, but also an estimate of future ones. 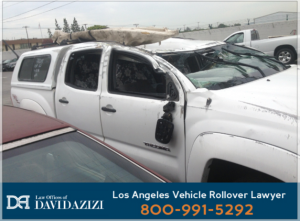 David has handled many car rollover accident cases in his 21 years of practicing law. His success is widely recognized. The highly prestigious Super Lawyers organization recently named him one of Los Angeles’ top attorneys for the sixth time, adding to his many endorsements. Other recent commendations include a “Superb” rating from major legal services corporation Avvo, and a place on Expertise.com’s list of the Best 20 Personal Injury Lawyers in Los Angeles. As David describes, in one case, his client came to him two years after the incident. Normally, evidence from the accident would be long gone from the scene. But against great odds, David won his client the settlement he deserved. This underscores the need to contact us just as soon as you’re able to. You may feel like you have too much to deal with already as you recuperate from your injuries, and we definitely understand that. Yet the sooner David can begin working on your truck, SUV or other vehicle rollover case, the better the chances will be that evidence from the scene can be located. The chances for accident witnesses to more accurately recall what they saw and heard will be better, too. The California statute of limitations comes into play as well. If the party that caused your accident is a public or government entity or an on-duty employee of such, you have a strict six months from the time of the incident to file a notice of claim. More information about claims against public and government entities can be found on our dedicated page for such cases. David also discusses in the video two of the most common causes of car crashes in rollover incidents. One is tire failure, which implies negligence on the part of the tire manufacturer, and the other is a broadside accident, which usually means another driver was careless or reckless. Tire failure often results in a dangerous tire blowout. Frequently, a driver will hit the brakes and turn the wheels sharply to compensate for the sudden pull from the damaged tire. The driver often over-compensates, however, causing the vehicle to swerve, tip over and roll. In some newer vehicles, Electronic Stability Control, or ESC, helps to prevent such events. A broadside accident means any auto collision in which impact is made on the side of one of the vehicles. After being hit on the side, an automobile can tip over and initiate a rolling action. Many of the worst car rollover injuries occur because passengers are not wearing seat belts. Frequently, these passengers are ejected from the vehicle and their injuries are either fatal or severe. Wearing seat belts increases the chances of survival in such incidents by 75 percent. If, as happens on occasion, the seat belts fail in an accident, then the manufacturer may be liable for the harm suffered by the passengers. As David discusses in the above video, one major cause of severe injury in rollovers is the crushing or collapse of car roofs. This frequently is due to negligent design or manufacture by the car makers. Failure of car roofs to maintain a protective distance above the head of passengers results in many spinal cord injuries and paralysis. Rollover air bags are a newer technological development that gives additional protection to passengers’ heads. They are deployed like a curtain, and actually help to keep passengers from being thrown from a vehicle in a rollover incident. Protect yourself and your family by downloading, printing, and keeping an auto collision checklist with your vehicle registration. The checklist will walk you through essential next steps to protect and preserve the evidence for your car crash case. We urge you to call us as soon as possible at 800-991-5292 for a free consultation about your case. David is confident that he’ll be able to help you, so much so that he offers a no-fee promise: if he doesn’t win your case, you don’t owe him a penny. Yet with a long track record of outstanding success, he looks forward to helping you to get the compensation to which you’re entitled.